If you are copy/pasting a post with html codes from another site, you must paste into the Text view. If you paste into the Visual view, the codes will not render properly. If you accidentally paste into Visual, simply cut and paste into Text. 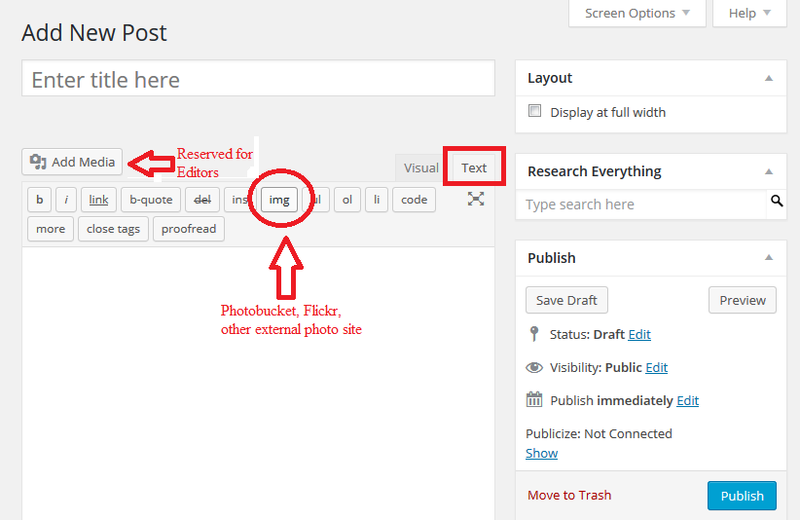 Choose Visual or Text by clicking the button in the Composing New Post window. You can flip between the tabs to see how your post will look or what code is generated. Always include the “Read More” tag in your post to split the post into an intro and extended text so that it does not overrun the posting boxes on the front page and send the entire post to the Email Subscribers. Only Editors should assign the “Featured Posts” and “Editors’ Choice” categories. Additionally, the Categories “Fighting Back” and “Motley Megaphone” are reserved for long-running series. Adding Images: To add images, change to Text (by clicking the tab) and use the “img” button. You will be given a prompt to supply the direct link code. If you have html code from your photosharing site (Photobucket, Flickr, etc) you can paste it right into the post once you are in Text mode. Click the Visual tab again to return to that mode. The Media Library, while it says “Reserved for Editors”, is available to all authors but should be used judiciously so that we stay within our hosting service’s limits. All Featured Images (the thumbnail for the post) must be in the Media Library to be available. However, if you have an image-rich post (a photo diary or an LOL, for example) please use a photosharing site rather than the Media Library. Be aware that inappropriate photos (for example, images that call for violence) or photos that are copyright violations will be removed and may result in the suspension of an Author’s posting privileges. To set a Featured Image for the post, click the link “Set featured image” in the lower right hand corner of the Compose Post screen and you will be placed in the Media Library to upload a new image or select an existing image. Be aware that Featured Images are cropped and resized by WordPress and may not look the way you expect them to on display.